This is the Beasts of Fable Book 3 Legendary Gorespine. The quest can be picked up from Gentle Sans, located in the Shrine of the Two Moons at 60,23. For this Encounter, My newst one and favorite team by far is : Arctic Fox ( or any fox that has dazzling dance, and howl) and Managerie custodian. I have the spider zerg as a back up, but it never gets to the third pet. This is one of my favorite combo teams! Start with the fox. Use dazzling dance, this makes all your pets speed increase and go first. 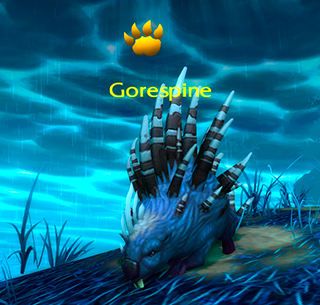 Gorspine will usualy start with his Spineskin shield. Sometimes he attacks, either way its not too important. Now attack with Bite, Gorespine will retaliate, usualy leaving ableed if he hasnt done so off the bat. Now look at your life total. 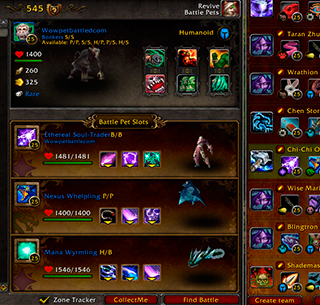 Gorespine hits for about 750, so we need to make sure we use howl on the round your sure the fox is going to die. So if hes 800+ then attack again, if hes below, use howl. Once the fox is dead and the Menagerie custodian is in play, start with shock and awe, if it stuns great, if not its not a problem. Once the round resolves, finish it out with Ion cannon. Gorespine just GOT OWNED!